LOS ANGELES — The aerospace company that built the solid rocket boosters for NASA's space shuttle fleet announced plans today (May 9) to develop its own private launch system — a spaceship and rocket — to fly astronauts to and from low-Earth orbit. The first manned flight could launch in about three years, company officials said. Utah-based Alliant Techsystems, or ATK, announced the new project here at the first Spacecraft Technology Expo, where thousands of government and industry officials have gathered to discuss innovative new technologies and the future of human spaceflight. ATK had already been working on a new private rocket, called Liberty, which it submitted as a contender in the second round of NASA's Commercial Crew Development program last year. Ultimately, the Liberty rocket was not selected to receive funding, but ATK continued development of the booster under an unfunded Space Act Agreement with NASA. As part of this arrangement, NASA shares its expertise in designing and testing the rocket but does not provide money for the project. Now, ATK has unveiled plans for a complete launch system centered around the Liberty rocket. The design includes a space capsule to carry passengers to destinations in low-Earth orbit, such as the International Space Station, said Kent Rominger, vice president and program manager for Liberty. The spacecraft will be able to carry seven passengers, or various combinations of crew and cargo. ATK also hopes to provide launch services for U.S. government satellites eventually, Rominger said. The composite crew module was built by ATK at its Iuka, Miss., facility as part of an earlier NASA program headed by the agency's Langley Research Center in Hampton, Va. from 2007 to 2010. The program aimed to assess whether composite materials were a viable alternative to aluminum lithium on NASA's Orion Multi-Purpose Crew Vehicle, which is being built for future manned exploration flights to deep space. "For Liberty, it made a huge amount of sense since composites were one of our competencies," Rominger said. "We wanted to pull in all the supplies and leverage all the work that has already gone into the system." The look of the capsule will be similar to the Orion capsule, except it will only perform flights to and from low-Earth orbit. The capsule, which will land over water, will be reusable up to 10 times, Rominger said. But ATK is hoping to use Liberty for more than just taxi rides to the space station. "We are looking at space tourism," Rominger said. "Also other [space] stations, such as Bigelow — we can help build the station. We're also looking at other nations that aren't partners on the space station that would like to have stand-alone missions." 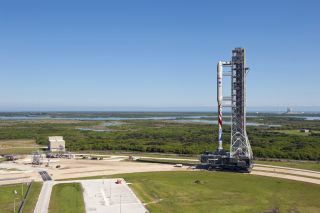 ATK is aiming to begin test flights of the Liberty system in 2014, with the first manned mission expected to occur in late 2015, ATK officials said. This schedule means that Liberty could be available to NASA and other potential customers by 2016. In September, ATK completed a full-scale test of Liberty's five-segment solid motor — the world's largest solid rocket motor, which was originally designed to be the first stage of the Ares 1 rocket that NASA planned to use to launch the Orion capsule on trips to the moon. The rocket was shelved after the agency's moon-bound Constellation program was scrapped. "Liberty can lift more than any other system," Rominger said. "Our capabilities can carry seven crew and significant cargo, which I think is unique. We really are a launch system designed for the 21st century to bring better reliability and safety." With NASA's space shuttle fleet retired (the last shuttle missions flew in 2011), the space agency now relies on Russian Soyuz rockets and spacecraft to ferry astronauts to and from the space station until commercial alternatives in the U.S. become available. NASA hopes that happens by 2017. The agency pays approximately $63 million per seat on Soyuz flights. But the Liberty system is designed to be more cost-effective, Rominger said. He did not disclose the projected price per seat, but did say it will be "significantly less than what we're paying the Russians today." The Liberty system is being built in partnership with Astrium, whose Ariane 5 rocket has served as Europe's primary booster for launching satellites and spacecraft into orbit. "One of the very exciting aspects of this program is having proven teams that have really worked on complex programs in various ways together," said John Schumacher, CEO of Astrium in North America. "This is the commercial industry coming together to provide a capability built on previous test work and investment in a very lean, commercial way." Lockheed Martin will also provide support as a major subcontractor for the Liberty System, ATK officials announced today. This work includes designing various components for the spacecraft, such as avionics, propulsion systems, navigation and control, and the vehicle's docking system. “The infrastructure we put in place that's already there to support testing and production is going to shorten the timeline," said Scott Norris, leader of the Liberty program at Lockheed Martin. "All three of our companies have worked together in the past, integrating things and working together. I think we're well poised to meet our schedule, as aggressive as it is, with things we've already paid for in the past." The Liberty rocket and spacecraft have been submitted for consideration for the third and final round of funding under NASA's commercial crew program, Rominger said. The agency's selections are expected to be announced in August. In the meantime, ATK is eager to continue development of the Liberty system. "For us as a nation, we need commercial crew and heavy lift to maintain our leadership in space," Rominger said. "To me, it looks like this is a team that we, as a nation, should be very comfortable with. Let's do this so we can get U.S. astronauts launching from the U.S. by 2015."